San Juan, Puerto Rico based AL Pizza LLC, has announced plans to open its first Fame Pizza Company restaurant in Bayamon Puerto Rico. With its motto of “You design it, we bake it!”, Fame is bringing customized pizza to Puerto Rico. San Juan, Puerto Rico based AL Pizza LLC, has announced plans to open its first Fame Pizza Company restaurant in Bayamon Puerto Rico. With its motto of “You design it, we bake it!”, Fame is bringing customized pizza to Puerto Rico. Starting with Fame’s fresh homemade dough, each customer chooses from any of the rich sauces, variety of select cheeses, and high quality meats and vegetables. Each pizza creation is then carefully fired in Fame’s world class stone oven. The result is a delicious customized personal pizza, all in less than ten minutes. 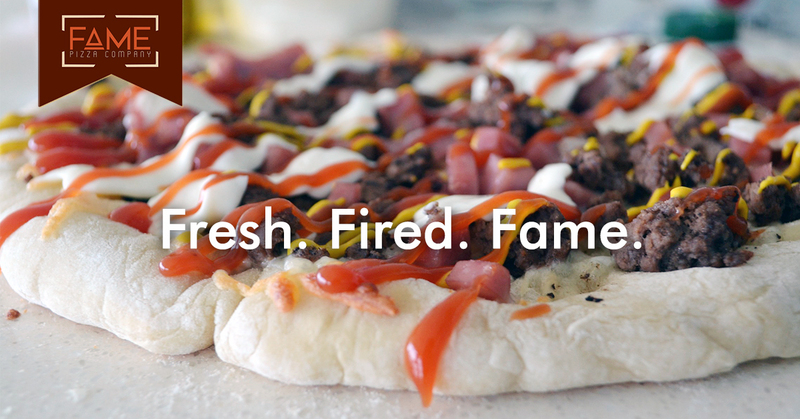 For those who are less daring, Fame also offers six signature pizzas from “The Flame” with sriracha drizzle to the “Sunrise” complete with ham, egg and cheddar. In keeping with its motto, Fame also allows you to design your own salad or you can choose from the classic Caesar or the Caribbean. Fame Pizza Company was created by the Jones family based on their culinary experiences from California, New England and Charleston, SC. Their goal was simple – great food in a great atmosphere. Fame is a place where families and friends with very different cravings can come and enjoy delicious food. Fresh. Fired. Fame.